The joy of the Lord is our strength (Neh. 8:10). Paul told us to rejoice in the Lord always (Phil. 4:4). Jesus said to be of good cheer in the midst of trouble (Jn. 16:33). 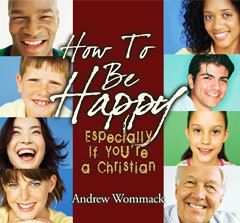 Yet many Christians find it difficult to be happy. Some have even taught that happiness is ungodly. But Jesus was happier than anyone of His day (Heb. 1:9). 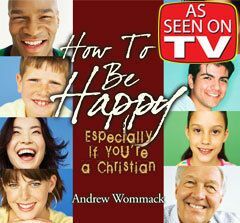 You may be surprised to learn what God's Word really has to say on the subject of happiness. Adam and Eve became dissatisfied with perfection. They believed they needed to be more like God when the truth was that they were already like God. Their hunger wasn't based in reality but in perception. Jesus' disciples weren't satisfied with Jesus. They said, "Show us the Father and we will be satisfied" (Jn. 14:8). If Adam and Eve and Jesus' disciples could be dissatisfied with perfection, then certainly we can be dissatisfied with our imperfection. Contentment is a state of mind, not a state of being. Paul learned to be content in extremely difficult situations. He even instructed slaves to be content with their lot in life and said that if anyone taught differently, they were proud, ignorant causers of strife! He said to "withdraw from them". Those are strong words that most people would disagree with today. But true contentment is not found in circumstances. Our joy is found in a person who is always the same. Therefore, our joy should be constant. Paul wrote the book of Philippians after he had been in jail between two and five years. Yet, 17 times in that letter Paul used the words "joy" or "rejoice". Paul's joy was independent of his circumstances. In this letter to the Philippians, Paul shares the basis of his unshakable joy. For him life was Jesus and death was even better because it would bring him closer to Jesus. Death to self is the only way to life and happiness. Ambition is the driving force behind most success. Goal setting and monitoring has become an integral part of everyday life for millions of people. Yet goals can become thieves that rob joy. Those who are truly "driven" to achieve are not content people. They don't allow themselves to enjoy success. There is a godly type of ambition that is in stark contrast with the ambition the world uses. The ambition that comes from God will manifest the fruit of the Holy Spirit (Gal. 5:22-23). On resurrection day, as two of Jesus' disciples were on the road to Emmaeus they talked about the reports they had heard of Jesus being raised from the dead. While they spoke, Jesus Himself came to them but they didn't recognize Him. It wasn't because he looked different. It was because he was different. He was in a glorified body that could only be discerned through the Spirit (1 Cor. 2:14). Likewise, the Lord is always with us but do we recognize it? Our problems will flee and our joy will abound by just acknowledging the abiding presence of the Lord in our lives.